I'd like to confess that I have an active prayer life, but I don't. I would like to blame the fact that I truly believe that life, in general, is a prayer -- and that all life activities are sacred (which means that you'd better pay attention to how you live life in general). It is a little like Sister Mary Corita's art which finds the sacred in the common world -- from a loaf of Wonder Bread which brings sustenance and yet signifies communion to many other ordinary items that enhance our lives and point to God in a myriad of ways. I love her point of view -- I don't have to pray to be cognizant of God since everything around me is cognizant of God -- I pray out of gratitude for all that I have been given. I don't know that my actions always support that generous point of view. The fact is that I am to lazy and forgetful to be grateful. I also believe in the power of prayer and also the power of meditation, but I have trouble turning off the world, turning inward, and paying attention to the universe. From time to time, I put aside time to read poetry or contemplate a more prayerful book, but then the habit gets broken and once more I ignore or avoid the disciplined self. I'm thinking of going to a Yoga class -- perhaps that may help. Sometimes church is inspirational, but more often it gets in the way since I have so many memories and issues with church that make me sorely miss my husband. I am lately listening to a podcast, "From Faith to Being", which used to be "Speaking of Faith." Each of those give food for thought. I began thinking of all this because of an experience at our table last weekend. I have to set the stage. We don't say grace nightly. Never have -- but do say grace sporadically, perhaps when we have church guests or when the spirit moves, or when we realize that we have gotten out of the habit and need to get back in again. In any case, we almost always say grace when our whole family gathers for holidays, and often, at those times, the Craswells and Marilyn Gorsuch are there. Last Sunday noon we had people over for lunch to say goodbye to Dani -- Marilyn, Keith, Eulalah, and Dani's in-laws, Jon and Margaret Wheeler. Since I didn't necessarily want to make it awkward for the Wheelers, I hadn't planned to say grace. As everyone took their plates to the table, I invited them to go ahead and dig in. Little Nico looked up and whispered to Dani something like, "Aren't we going to say grace?" Dani replied, "Do you want to say grace?" "Yes," he answered. "Who should say grace, Nico?" And, he wanted me to do so. Now, Nico is the one who never wants to hold hands and appears to put up with grace as long as it's not too awfully long and he can finally get to his food. I was surprised and pleased and he realized that something important was missing from our gathering. It was enough to make me very proud of family traditions. It was also enough to make me realize that out of the mouth of babes sometimes great wisdom comes. Because of Nico, I'm going to pay more attention to my spiritual life this week! Thanks Nico. I love you lots. Love, grandma! Mom: "I just saw that thingy in front of that house." Dani: "Oh, yah! I saw it too!" Dani: 'I went to school with him." We speak in generalities -- and yet, we always understand what's being said. We are inspecific and yet clear to the persons we are speaking to (as long as they are related). It usually has to do with context. Dani mentioned something about her website. I said, "Have you heard from what's her name?" James then erupted in, "Wait! How did you know who she meant?" Dani said, "Because I knew that mom knew I was waiting to hear from Charles and Ellen. And, I knew that she knew I talked to your dad last night. So, I knew that she was wondering about Ellen. Simple!" I said, "I know, it drives you crazy. It drives Uncle Ron crazy too." I guess every family can speak in shorthand. I know it is lazy, but sometimes it is what I can wrap my brain around in the moment. Sometimes we just finish each other's sentences. Mom: "I'm thinking of going to the ummmm..."
Martin: "Store. What are you going to get?" It isn't really a guessing game because the other person always seems to actually know what is in my head - but sometimes I can't get the word out as fast as the whizzes in my family and they probably get tired of waiting. So they just finish my sentences. Sometimes I'm thinking of more than one thing and not paying attention to what I am saying. Mostly I'm just slower than the younger generation -- so they just help me along! But, the habit of being inspecific is a long term one - having nothing to do with age. The funny thing is that the in-laws seem to get the process down pretty quickly. Not too long ago, Ron was speaking to Jeni and me and clipping along with our strange, inspecific patter when he got a look of sheer horror on his face. "I can't believe this!" he said. "I'm doing it too!" It's all about context and knowing your speaking partner very well. 1) Early morning television - mostly cartoons. Nico is up earlier than his grandma and earlier than his mother would like. I can hear Dani fiddling around in the kitchen getting his breakfast and making tea which often teases me out of bed for a cuppa and an update on the day. 2) Three million legos and super guys in the oddest places. My new downstairs room (aka pool room) is a lego haven for big and little guys. Since I was hoping that the grandchildren would have a place to go, I'm delighted to see it fill its' destiny. This morning in that room Nico is playing with legos, and James and friend, Eliot, are playing video games. Yesterday was Eliot's 16th birthday and his parents are in Tofino. So, Eliot had a birthday dinner with us and stayed the night. Eliot often stays the night and doesn't mind the attic room. He is a keeper! I think I will adopt him as a 4th grandson. There are super guys and lego concoctions all over my sofa this morning. I trust they will disappear when we get to cleaning up. 3) Interesting experiences - this morning Dani routed out the ancient waffle maker (I bought it for my parents when I had my first job at 15). It is ornery and sometimes works well and sometimes doesn't. We threw away several waffles (or pried them out of the machine) before we had any we could actually eat. I wish I had my parent's original waffle maker which was a huge cast iron base that you sat on the burner - the waffle part was flippable with a wooden handle. My father refused to use the one I bought him. All the boys were excited about waffles this morning. 4) Food has been an adventure. It is great to have a daughter who is a marvelous cook. Last night I tried a new zucchini risotto that I found on Twitter (Mark Bittman), and Dani cooked steaks. James suggested brownies for Eliot's birthday cake. We all have ideas and take turns deciding who does what. Dani, however, is the best green salad maker -- so she gets that chore. Nico eats up all of the sandwich meat, the avocados, the cheese, the pasta, and as many sweet treats as he can find hidden. Unfortunately, he has decided that he can raid my refrigerator at will -- and when he is suspiciously quiet, I can find him opening the freezer to see if there is anything like a popsicle hiding somewhere. So much for a bottom freezer! The most interesting dinner we have had lately is sausages and grapes cooked together, the grapes forming a sweet sour sauce for the sausages. It was delicious! 5) We all love television. Our evenings are sometimes spent catching up on the new program, "Suits", about a law firm. We also keep up on "The Closer" and "Barefoot Contessa." Dani and I are reading Italian and French mystery authors in between all her other literature. James is finally finished with his gigs for the Bellingham Youth Jazz Band -- that kept us very busy with sometimes four a week. Neighbor AmySue and her two boys spend lots of time going back and forth, and Dani is often conversing on Skype with Charles and planning the move. In between these things, we attempt to keep some order in the household. 6) Nico goes to preschool every afternoon but Friday, and Dani and I often go to lunch. Although we both love the tearoom, it can get pretty pricey. We keep making new resolutions not to go to lunch and to give up Diet Coke -- but usually ignore both of these and do them anyway. We are not helpful to each other in that regard - although we were pretty good this week - until Dani took James and Eliot to the sushi restaurant yesterday and spent a bundle on the hungry boys. We say we are going to exercise and lose weight - to no avail! 7) We go to bed too late and get up too early! The washing machine is in constant use and James continually steals my towel because he forgets to get one for himself. But, he also takes out my garbage, carries all the heavy loads upstairs, and mows my lawn even though he hates my electric lawnmower. Life with the four of us is busy and chaotic and fun. Dani and the boys are pretty upbeat for being displaced, excited about their coming adventure (especially since they have landed a great house in Hong Kong), and really try to keep things on a fairly even keel for me. Uncle Martin and Lionel are visiting this weekend to go to the fair with us. Augmented family visits add to the fun. Although quiet and solitude are on the short side around here, I will miss the hustle and bustle of good company when they all depart. I guess I'll have to plan a visit to Hong Kong. I spent $67.00 at Haggens yesterday morning after going for just one item that we needed for dinner. How did that happen? Well, of course it happened because I bought a few more items than I planned to buy. But, even at that, my mini cart was not very full. I would like to blame it on extra people at my house, but frankly Dani has bought lots and lots of groceries too -- and we have marveled at the price of them each time! Groceries are very expensive at the moment. I have never worried too much about what I wanted to buy because it wasn't that much in quantity. I do check prices on some items, but others I just buy when I want. However, I find myself weighing carefully these days because I can spend easily over $100 without trying. I never used to spend over $100 unless it was a holiday and family were coming for Christmas or Easter dinner. Now, you can spend over $100 for a simple meal in the middle of a dreary week. The bag of cherries I picked up to buy was $14.00. I guess I don't need cherries. The NY Times had a recent article about the surge in food prices and mainly blames it on a huge global harvest failure due to climate changes. The food index indicates that food prices rose .8% in 2010 and 3 to 4% in 2011. Seems like more than that -- but perhaps it is a good time to go on a diet! Later in the day I discovered water under my kitchen sink. In fact, my recycling bin had about 2" of water in it. When Dani was free, I had her sleuthing under the sink while I turned on the faucet by itself, then the garbage disposal, and she found water dripping with just the faucet turned on full blast. The dishwasher seemed to check out fine. So, I called Orca Plumbing. Orca had been the plumber of choice by my contractor, Tom. They had done most of my kitchen work during my remodel. I talked to the owner who asked what kind of a faucet I had. When I told him, he said that most of the problems with that faucet had to do with the hose coming unscrewed over time. He suggested that I pull out the hose and turn on the faucet to see if it would leak into the sink. I did, and it didn't. But, it didn't come all the way out. So, I twisted it over and over to see if I could tighten it anyway. Dani and I tried the water once again and VOILA! No leak. Now, I do like a plumber that tells you over the phone what to do to stop a leak and dodge the expense of a plumbing visit. Finally, my day ended on a more frustrating note. James, Nico and I went to dinner at Fiamma Burger and then went to the train park on the other side of town. On the way back to my house, I decided to take Nico to see the fish tanks at Squalicum Harbor. While tripping lightly up the steps, my shoe caught and I fell flat on my face. I scared James half to death. I knew I wasn't seriously harmed, but realized as I picked myself up that I was scraped up and had done something to my left hand since my pinky felt a bit weird. We went on to see the fish tanks and I kept rubbing my hand. After I came home, I decided that it still worked fine so I took a bath and went to bed with a few aspirin. Today, I have a huge scrape on my left leg, am sore in various places around my shoulders, and the hand above my left pinky is swollen. Since my fingers works fine (I can even type), I presume that my poor little pinky will heal without medical attention. I cut the fingers out of an old glove and am wearing it to keep everything aligned and snug. But, it wasn't the best ending to a fun evening with the boys. That was my day yesterday. A typical day where you win some and lose some. You get brought up short by having to change your lifestyle. You have to take a few lemons and turn them into lemonade. Just life at its very best! Wonder what today will hold! I hate to come home from Ashland. I just want to stay and see plays forever. Of course, the weather always helps. It was in the 80's, but often breezy and warm. Every play at Ashland is well done, but some experiences are unforgettable. This year was no exception. 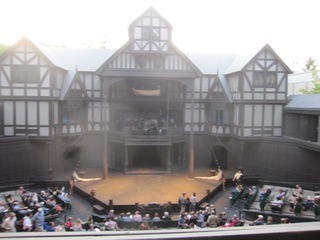 We saw three evening plays on the outdoor Elizabethan stage in the balmy outdoors - Henry IV, Part two (my least favorite since I got tired of Falstaff), Love's Labor's Lost (second from the bottom, but an enjoyable farce), and The Pirates of Penzance (a modern, and very clever, rendition). Each of these had prefaces - an hour spent learning about the play and the setting, the politics, the back story, etc. -- windows into the performances that made them all the more enjoyable). The Bowmer Theatre had been closed down early in the season because a cast that was rehearsing heard a large crack in the main beam and were evacuated. All the plays had to be moved for over a month until repairs were made. Fortunately, for us, it had reopened and the casts were thrilled to be back in their right place. 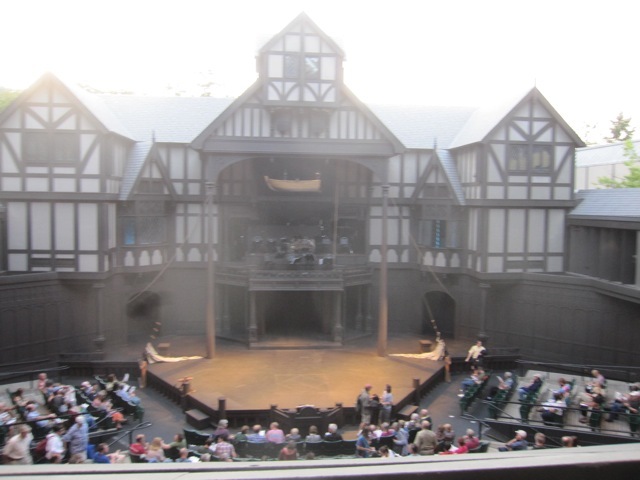 We saw three plays in the Bowmer which is a beautiful venue - Moliere's, The Imaginary Invalid, (hilarious), August: Osage County (a magical performance), and The African Company (mixed feelings about the play, but some great dialogue). These three plays were followed by a post session where one of the actors comes immediately out and talks about their play and the performance for about 1/2 hour. Our final play was Ghost Light in the little, intimate theatre. It was my favorite because the script was so very well done and the acting superb. Vacations always have a rhythm and Ashland is no different. We loll around every morning with computers, books, meandering around town, and usually breakfast and lunch at our flat. But, then we get in gear for play activities all afternoon and evening. We usually get together in the flat after the day's activities and debrief the plays over wine. This year, we attended so many prefaces and post sessions, we didn't even spend much time relaxing in the member's lounge where you can pick up coffee or wine and snacks. We didn't have enough time. Every night there is a green show in the courtyard before the evening plays, but we didn't have time for that either. Not only are the plays delightful, but the town is also. All the buildings and grounds of the Shakespeare festival are beautifully tended with bright colored flowers and everything is aesthetically pleasing. I love the parking garage where you can buy a ticket for $3.00 which allows you to come and go anything from early morning until 2:00 a.m. the next day. Best deal in town. Of course, best of all is the fact that I have never been in a place where every play you see is amazingly well done. Even when you don't care for the play or feel you would have preferred to see it in one of the other theaters, or you are not sure of the rendition, the quality of the acting and the stage production is always excellent. Where else would you go to seven plays in a row and not think one or more was poorly performed? The company of actors is fairly steady and it is fun to see your favorites again and again in different roles. What is amazing to me is how some of those very actors can play a leading role in one play and three hours later have the energy to take on a completely different role in another play. Well, that is Ashland. I've written about it before, but I always come home with such feelings of pleasure and an aftertaste of a lovely experience. Good friends, great conversations, wonderful entertainment, good food, relaxing vacation, food for thought, and lots of excitement about doing it again and again. I'm sitting in my friend's living room on Orcas Island gazing at the Puget Sound and watching the boats glide by. A tiny squirrel keeps trying to sneak through the doorway and a baby deer sneaks past the patio on its pathway to the water. Normally there many horses in the near fields, but I don't see them today. Perhaps they have been moved across the road. The sun is shining although the temperature is lower than yesterday. 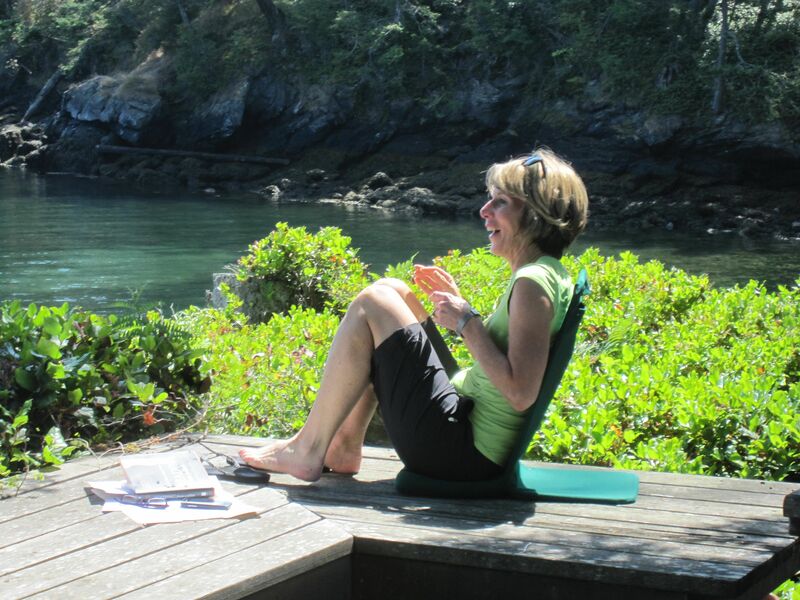 It is our two day writing retreat that Margie, Bev and I take every few months or so. Normally, we meet in Bellingham at my home or Margie's for an afternoon, but we escape to Bev's house on Orcas whenever we can. Eating, sleeping, writing, and talking about writing and church and families with good friends in a perfectly beautiful setting is absolutely heartwarming and extremely therapeutic. It is always a quiet and calming experience and often a jump start to creativity. I have been working on some church business that is coming up -- some organizational structure for a new committee that is forming. Margie has been working on her new blog and Bev is in her study doing something more mysterious -- that is, I don't know what she is working on. Since I've done no creative writing today, I decided I would at least check in on my blog. Don and I used to vacation on Orcas thirty years ago when we first came to Washington. There is a small cabin just a stone's throw from my present location. Bev introduced us to one of the two brothers who then rented it out. It had a beautiful Japanese design with a wooden deck that ran around all four sides of the house. At night, we could often hear the clump clumping of hooves as deer traveled around the house on the deck. The place was simple and comfortable. We must have rented it four or five times in those first years in the Northwest. It was a lovely little getaway. The cabin is now owned by just one of the brothers, an artist who is in residence more often than those early years. I don't think they rent it out any longer. But, we did love to come to Orcas. It was our first introduction to ferries. We learned how to prepare to wait, carrying books and food to tide us over if we missed the ferry. We learned about Island Time and patience. We loved East Sound and the little stores especially Darvill's book store. I don't know why we stopped coming here. 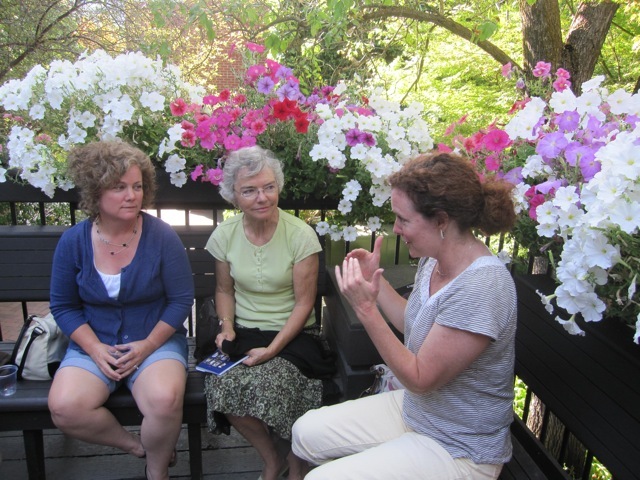 But, we moved our vacation venue to British Columbia and often to Yellowpoint Lodge in Ladysmith on Vancouver Island. It was one further step into being lazy -- at Yellowpoint we had lodging and meals provided -- all for the same price. We even had tea at 10, 2, and 8 in the evening. We had the ocean, a salt water pool, miles of trails, kayaks, overstuffed chairs and sofas and outdoor lounge chairs. Somehow it appealed to us, and we learned to love Canada. Of course, we went to other places, but at least two or three times a year to Yellowpoint. We still had to take a ferry, although the Tsawwassen ferries run hourly to Nanaimo just north of the lodge. I haven't been back to Yellowpoint since Don died, but I'm warming up to the idea. We always loved vacations. It was a time when our family did not have to share Don with his busy schedule and business of the congregation. In the early years it was the high country of Yosemite. Then, when our kids were teens, we went to Yosemite for a week and Balboa Island for the second week. We rented a house on the beach and the teens had the run of the island. Both places had good friends and their families involved. Roger and Ann Woods were a big part of our Yosemite adventures and Patti and Ralph Rea our playmates in Balboa. I had gone to Yosemite as a teen and always loved the mountains. My girlfriends and I had sung in the evening show that followed the fire fall in Yosemite Valley. Someone had heard our trio singing while doing dishes in my friend's campsite and invited us to perform that evening. I was delighted to take my own family back when I had kids. Martin celebrated his first birthday with a picnic lunch dressed in a bright green snowsuit on April first on the road into Yosemite Valley. We had arrived in the valley to a few inches of snow and had to run down to the Fresno Sears to buy some warm clothing. Spring in Yosemite is not always fair weather! One of the reasons I miss my husband the most is that I miss vacations with him. He was my wood chopper, my hot cocoa maker, my bicycle partner, and he always did the lion's share of the kayak paddling. He was just good fun and we had great adventures together. So, sitting today on Orcas is not only soul satisfying, it is also nostalgic. This is a special place to visit! 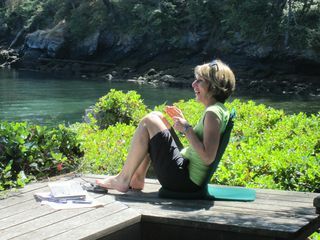 Margie Working on Her Blog in the Great Outdoors!